Most of us will suffer from some form of back problems at some point in our lives. Some of us, though, will have serious back problems that will require extensive treatment. Most cases can be treated through non-invasive procedures such as massage, heat therapy, physiotherapy or medication. In some cases, it is estimated to be one in ten, surgical procedures are the only way to alleviate the problems caused by back problems, such as a slipped or herniated disc. What is The Spine Clinic Disc Surgery? The Spine Clinic Disc Surgery is a specialised clinic looking into conditions affecting the spine. Led by a consultant and a team of specialists, they provide the best possible care during the investigation and management of your back problem. If surgery is considered the best option for dealing with your condition, the surgery will be performed by the leading consultant at the clinic. Surgery is always seen as the last possible option and all other avenues will be explored first. Discectomy – this procedure will try to remove the bulging or protruding disc. Spinal decompression – this procedure tries to enlarge the space within the spinal canal, decompressing the nerve roots. Wallis ® dynamic stabilisation – a reversible alternative to spinal fusion, developed and researched by the lead consultant of The Spine Clinic himself. Dynamic stabilisation using flexible rods – flexible rods are attached to the spine, allowing for greater flexibility and mobility of the spine. Hybrid techniques, where a combination of treatments is used, such as dynamic stabilisation and spinal fusion. Cervical disc replacement, where an artificial disc replaces the existing disc. Consultation costs are £210 for a 30 minute appointment; and £150 for every 15 minute follow up appointment. Each procedure has different costs attached to it and prices can be made available on request. Payment schemes are available through the hospital and The Spine Clinic Disc Surgery would be happy to discuss these with you. The Spine Clinic Disc Surgery is located at the Nuffield Health Wessex Hospital in Eastleigh. They offer private rooms with full facilities, including catering and wine cellars, hydropools and radiological facilities. Of course, they are committed to health and safety and take all necessary precautions to prevent MRSA and other infections. So, if you do require a surgical procedure to deal with your back problem, you can be safe and secure in the knowledge that The Spine Clinic Disc Surgery will offer you the best possible care as well as after care in their state of the art location. 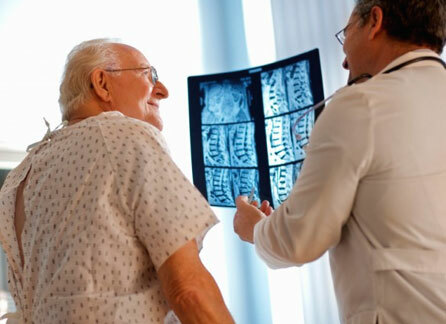 Surgery will only be offered as a last resort and would be performed by the lead consultant himself, giving you full peace of mind that your spine and back are in safe hands.